It’s been a particularly dreary winter. I was tempted to say dreadful, even though it hasn’t been cold, and the poor folks suffering flooding from the almost endless succession of Atlantic storms would probably agree. Finally, the storms having abated, I’ve been out and about hoping that my avian friends would offer some respite to the winter tedium. Looking at my bird catalogue, I noticed a few glaring gaps of common species. 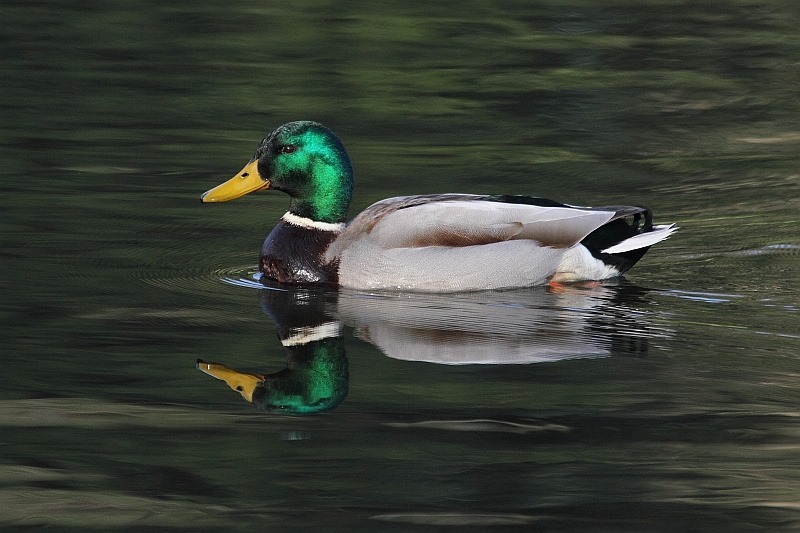 It’s easy to overlook ubiquitous species and simply “forget” to press the shutter release “’cos it’s just a Mallard”. Wait a minute, I hadn’t actually got a picture of a Mallard. Actually, I hadn’t got many ducks at all, just a good old Tufted Duck (Aythya fuligula), a.k.a. Tufty. My first trip was to Startops reservoir at Marsworth thinking that I might at least correct my Mallard oversight. Though the rains may have relented, it’s still necessary to be wary of where one tries to walk; most countryside footpaths are still quagmires and are likely to remain so for some time to come, I suspect. The reservoir was attractive because it has a reasonable path in places. I snagged my Mallard (Anas platyrhynchos) record shot and there was even some sun to help. Common they may be but their colours can be stunning. I gingerly picked my way along a muddier-than-I’d’ve-liked footpath to the adjacent Tringford reservoir. I say adjacent but there’s a road in between. Where I crossed the road a group of three birders were staring through a shared spotting scope across the reservoir. One explained to me that there was a pair of Red-crested Pochards (Netta rufina) on the far side of the water. They offered me a look through their scope, though I must confess I didn’t really know what I was looking for. 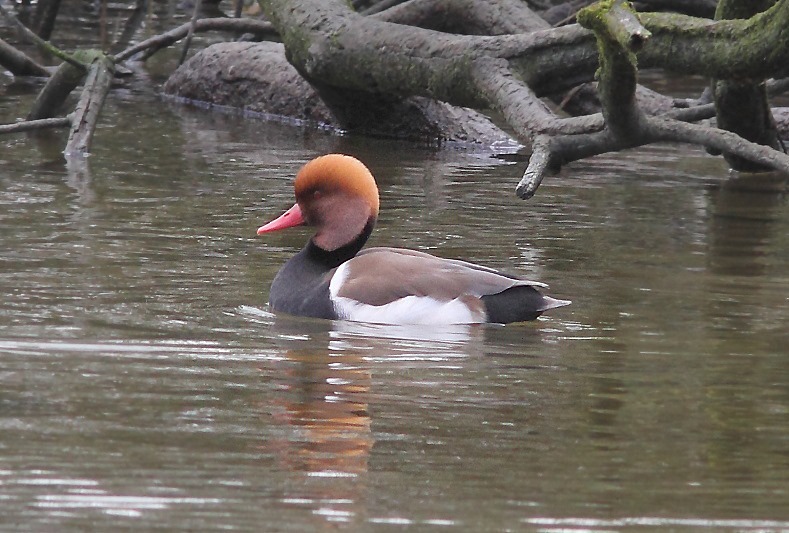 I’d heard of a Pochard but not the red-crested bit. I thought I could see what they were getting at but wasn’t certain. I wandered around the edge of the reservoir to try my luck and eventually got a distant shot of the reason for their excitement. This really dos have a noticeably red head. Add another one to the catalogue. A couple of days ago we had a sunny afternoon to contend with and made a late trip to College Lake, a BBOWT reserve just outside Tring. There was a bird hide in the sun but it was occupied and looking into the sun, not well placed for photography. We made our way round to another hide facing away from the sun. I fully expected it to be busy but was surprised to find it empty. Maybe most birders aren’t photographers? Perfect! We settled down to see who was around. 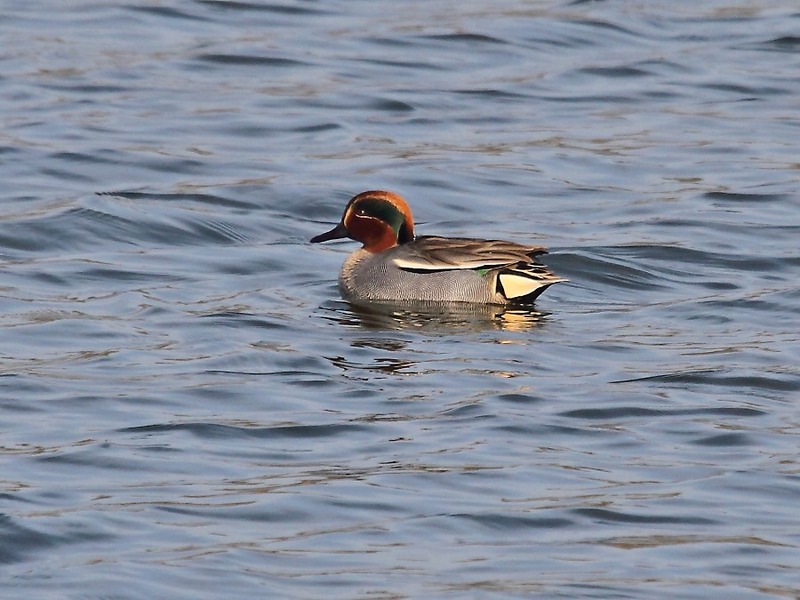 There was a handsome male Teal (Anas crecca) bobbing aboutin some reasonable light. They’re small little critters with a striking green patch around the eye. As usual it was more distant than I’d have liked but just within range. 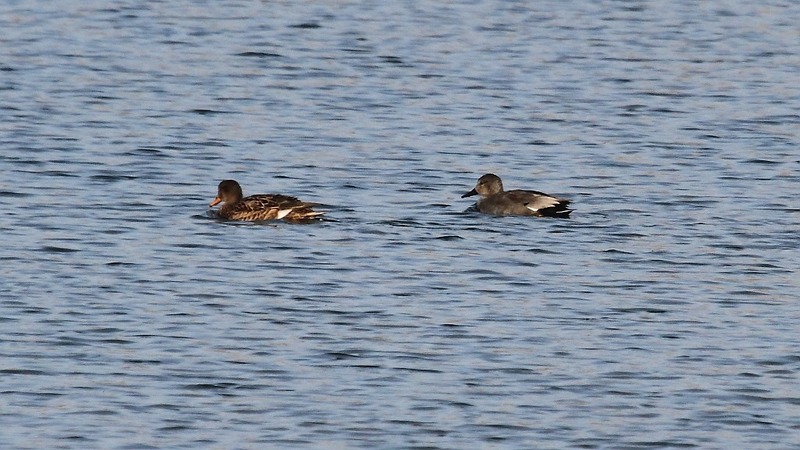 I thought I’d spotted a Common Pochard as we made our way round to the hide, though it was too distant for the camera. 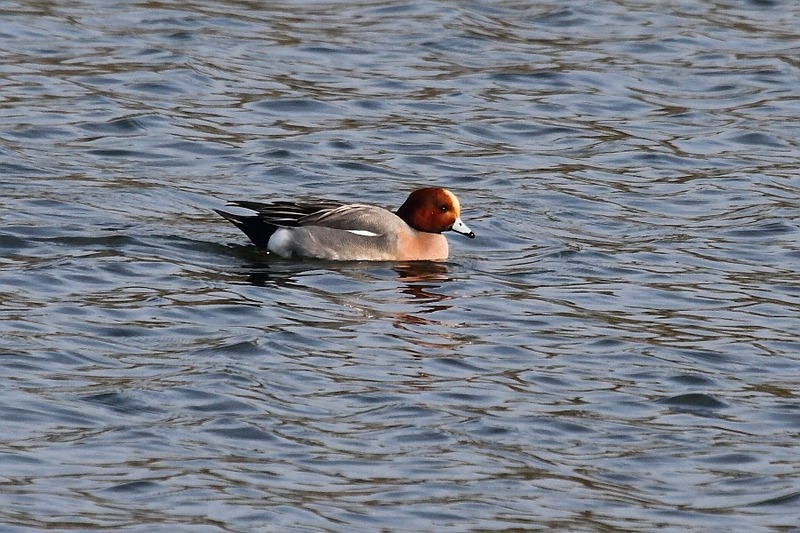 As we watched from the hide, I was guilty of assuming that there were several more Pochards – reddish brown heads – swimming about. Finally we realized they were different and unfamiliar, having a pale buff blaze on their foreheads. A handy notice in the hide informed us that these were Wigeon (Anas penelope). At a greater distance, Carol spotted through her binoculars another unfamiliar looking dabbling duck – some ducks are diving ducks and some ducks are dabbling ducks – with a dark rear end, visible every time it dabbled. It also sported an almost black beak. Once again, the handy notice in the hide came to our rescue; we thought this must be a Gadwall (Anas strepera). I snagged a very distant shot of a pair for the record. So, my duck catalogue was growing nicely but I was still missing my Common Pochard (Aythya ferina). We’d spotted some at a distance on Willen Lake in Milton Keynes a short while ago so yesterday, since I would be heading in that general direction in search of new bird food, I popped back to try my luck. At first things looked less than promising, the lake appearing almost deserted. 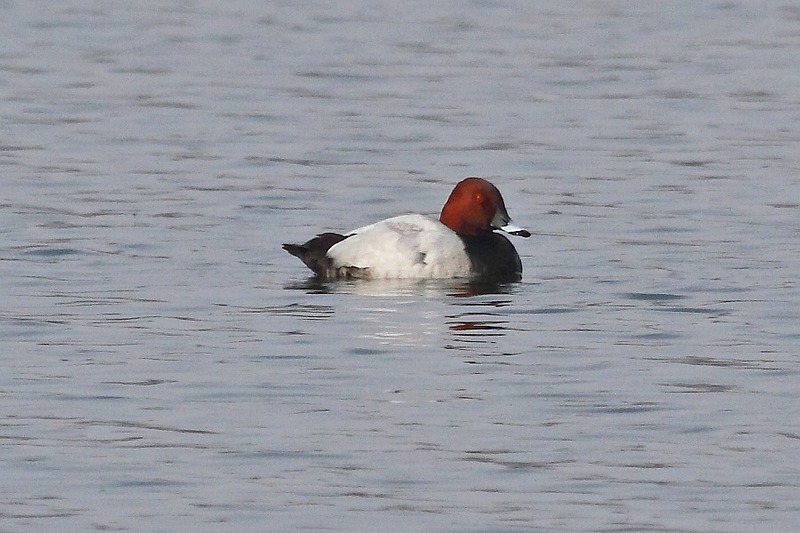 I did walk part way around the lake, though and, amongst the common Tufties, I did see a Pochard which eventually turned round to allow some sort of record shot. The duck catalogue has grown a little from being just a Tufty. I really must try and snag a Shelduck.